For inquiries related to applying to our graduate program please contact one of our RISC faculty members. Please ensure that you have read our admissions FAQ and our admissions requirements. The RISC lab welcomes Elisabeth Boyce-Jacino (graduated from Vassar College) and Rebecca Adler (graduated from Northwestern University) as new lab managers! The RISC Lab is seeking a new Lab Coordinator! See more information here. Maria Brucato and Mia Velazquez gave talks at the Penn State Thinking Within Symposium, organized in part by Dr. Nora Newcombe! December 2017. Dr. Allison Jaeger gave a talk and presented a poster at Psychonomics this past weekend! Zoe Ngo and Mia Velazquez also presented posters. November 2017. Congratulations to Zoe Ngo on her Travel Award for Psychonomics in Vancouver! November 2017. Welcome to Maria Brucato, Susan Benear, and Rebekah Banerjee – our newest graduate students! Fall 2017. Dr. Nora Newcombe and Zoe Ngo’s work on the development of pattern separation as part of episodic memory in young children was featured in an article on the Temple Now website. April 2017. 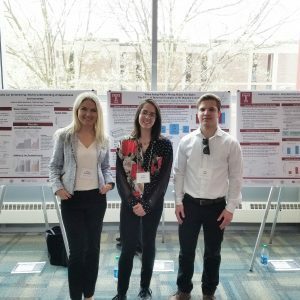 Several of our interns presented their work at the Temple Undergraduate Research Forum – Creative Works Symposium (TURF). April 2017. Ying Lin will be giving a talk, “Tracking the relative development of relational memory and pattern separation”, at the Eastern Psychological Association (EPA) 2017 Meeting. March 2017. The RISC Lab was featured in the Spring 2017 Big Questions, Vital Answers Newsletter, in an article written by Zoe Ngo. February 2017. Congratulations to Corinne Holmes for successfully defending her dissertation to earn her doctoral degree. January 2017. Dr. Nora Newcombe is Organizer for Applications of Embodied Cognition to STEM Education at the 20th ESCoP Conferference in Potsdam, Germany, with talks to be given by Dr. Allison Jaeger and Dr. Steve Weisberg. September 2017. We welcome a visiting scholar, Dr. Xiang (Daisy) Qiu. December 2016. Corinne Holmes will be a Post Doctoral Fellow at Trinity College in Dublin starting February 2017. She will be working with Dr. Fiona Newell and the Multisensory Cognition Group. Special Issue of Cognitive Research: Principles and Implications, Vol. 1, Edited by: Dr. Nora Newcombe and Dr. Steve Weisberg. December 2016. Dr. Thomas Shipley lectured on “Science of Learning in STEM Education and Practice: Expanding our understanding of cognitive science and disciplinary science through education” to the Geology and Environmental Geosciences Program at Northern Illinois University. Corinne Holmes was awarded a travel award to present her poster at Psychonomics in Boston, MA, November, 2016. We are accepting graduate students for next year – contact one our RISC faculty members for more information. In November of 2014 SILC hosted a Science of Learning Workshop at the International Mind, Brain and Education Annual Meeting. The workshop brought together science of learning researchers from cognitive science, neuroscience and education and featured talks from three world-renowned researchers: Daphne Bavelier, Yuko Munakata and Mitch Nathan. Kristin Gagnier and Jamie Jirout presented at the International Mind, Brain and Education Meeting in Forth Worth, TX, November, 2014. Steve Weisberg, Corinne Holmes & Chi Ngo present at Psychonomics in Long Beach, CA, November, 2014. At the annual Geological Science of America conference in October 2014, Tim Shipley and Basil Tikoff hosted a workshop designed to help educators improve students’ spatial reasoning. Lectures focused on known difficulties in student learning of spatial skills, laboratory studies designed to evaluate and improve spatial skills, and a cognitive framework for addressing spatial cognition. Welcome Alex D’Esterre and Kate Margulis, our new lab managers for RISC. Tim Shipley was awarded a new National Science Foundation grant to join a team of geologists and computer scientists in a Research Coordination Network, “EC3 – Earth Centered Communication For Cyberinfrastructure: Challenges of field data collection, management, and integration” to develop cyberinfrastructure resources for field geologists and students. 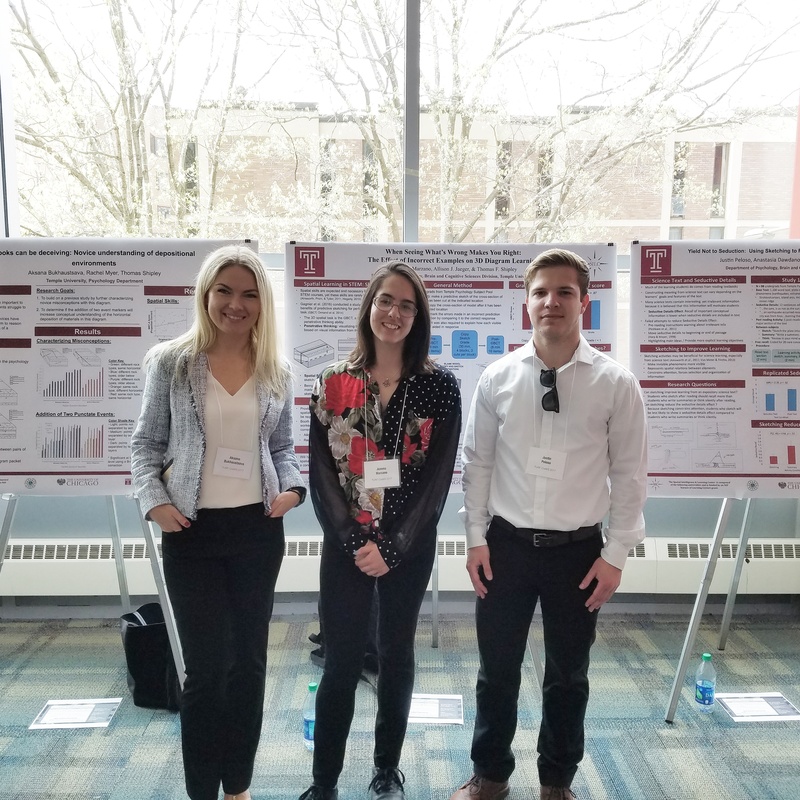 Kristin Gagnier presented a poster on “Biases in the Perception of 3D Forms from 2D Cross-Sectional Views” at the annual meeting of the Psychonomic Society in Toronto, CA. Kristin Gagnier lectured on “Improving Penetrative Thinking Via Progressive Alignment and Directed Sketching” at The Geological Society of America Annual Conference in Charlotte, NC. Ilyse Resnick will be an IES Postdoctoral Fellow at the University of Delaware starting January 2014. She will be working with Nancy Jordan, Roberta Golinkoff, and Henry May. Ilyse will continue research on magnitude representation and spatial cognition. In August 2013, Kinnari Atit presented a poster titled “Spatial Gestures Point the Way: A Broader Understanding of the Gestural Referent” at The Annual Meeting of Cognitive Science Society in Berlin, Germany. Kinnari Atit’s lecture “Spatial Gestures Point the Way” was presented at The Sixth Annual Inter-Science of Learning Center Student and Post-Doc Conference in Philadelphia, PA. Welcome Kelly Bower, our new lab manager for RISC. Welcome Justin Long, our new program coordinator for SILC.